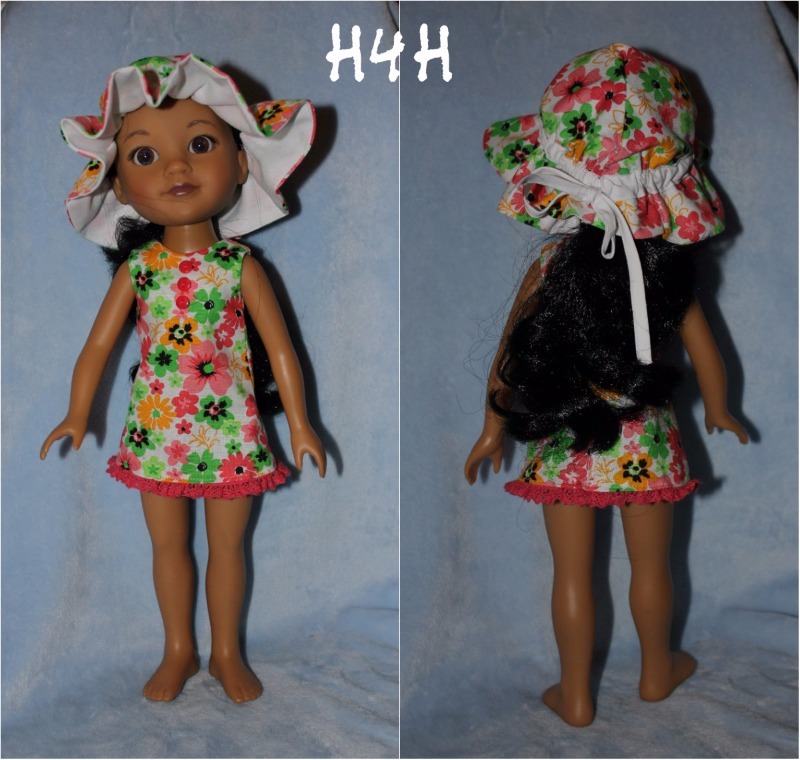 Your 13-14 inch doll will be ready for summer fun, whether at the beach, the playground or with her friends in her cute and casual Sixth Grade Skirt. Pair it up with a Popsicle Top to complete your doll’s casual wardrobe, or a turtleneck or blouse to make her ready for school! The Sixth Grade Skirt is a simple to sew, classic A-Line skirt with lots of design options. With hook and loop tape closure in back, it's easy on and off for little hands. This pattern is also a perfect starter or beginner pattern for girls that want to learn to sew for their dolls, or for more experienced seamstresses to make a basic doll wardrobe. Mix and match fabrics to create a different look each time your sew. Add trims, buttons and appliqués to make your skirt truly unique. This classic but simple skirt is very easily made from a quarter yard of fabric (quilter's fat quarters work great!) in a woven cotton or other lightweight fabric. Mix and match your fabrics for unlimited design options. On such small dolls, heavy fabrics may be too bulky to create the desired look. Special Note: This PDF sewing pattern was specifically designed and tested on 14 inch dolls such as HeartsForHearts and Les Cheries. Not all dolls, even of the same brand, are exactly the same size. Be sure to measure your Sixth Grade Skirt on your own doll to ensure a perfect fit. My dolls have a waist measurement average of 5 ½ to 6 ¼ inches. This pattern is also available for American Girl and Disney Animator Dolls! PixieFaire and the designers featured are not affiliated with Hearts for Hearts or Les Cheries.. I love this pattern! It was so easy to make and I love the fact that I can use either with other tops or bottoms. OhSewKat has resized this Sixth Grade Skirt for many different doll sizes. I was so glad to see the pattern for the Les Cheries dolls since I just purchased one from PixieFaire. What a sweet little outfit the Sixth Grade Skirt and Popsicle Top make for this slim little cutie. I'm always amazed how quickly this skirt sews up and how cute it looks, even without lace or embellishment or patterned fabric - just made it in lightweight denim with top stitching. Simple. Sweet. Love it.